It's the story of a man who had broken wings but forgot he had legs. He kept flying in his imagination thinking his two legs were useless in his imaginary world. He spent days by his window pane, watching all these mechanical hearts wandering in the streets but he once saw a human silhouette walking away. He wanted to call her but he was voiceless after so many years without talking. He tried to get off his seat but he was unable to stand up as his legs were no longer strong enough to support his body. He could not believe he had missed that one human he had been waiting for so long. He wanted it to stop, he wanted to be 'human' again but he wondered whether it was too late or not. He started thinking about two mechanical legs that could help him out with his handicap. He thus called a taxi. A cyborg drove him to hospital where another cyborg took care of him. As it was rare to see a human in there, the chief cyborg doctor decided it was an emergency case. In a few hours, John came out with new mechanical legs and a louder voice - thanks to a miniature speaker transplant. Unexpectedly, he felt so more human and lively with all these ‘high-tech grafts’. He decided to take a walk in the city. Mechanical hearts didn't bother him anymore, after all what was the point of being real if you only lived in your imagination? It was now lunch time and he sat in one of these cyber-eating places where cyborgs ate things they could not taste, just to act as humans. Yet John could spot a woman with a grin on her face, which made him realize she could actually taste how bad the food was, contrary to cyborgs. He thus stood up and came up to talk to her. He introduced himself as 'John Golem' and asked if she would have a drink with him, on which she agreed. She happened to have never walked down his street, so there was no chance she was the charming silhouette he had seen earlier on that morning. Yet he could not but rejoice at this charming moment they were sharing and could not wait to see her again. They exchanged email addresses and eventually parted. A few days later, they met again. John had not stopped thinking about her. He wanted to know if he had feelings for her though this sounded a little old-fashioned in a world where partners were sorted out by a sophisticated computer programme. He felt that he needed to touch her to know if any true affection was at stake. Anyway they went to the movie theatre and saw an old romantic movie from 2010. During a romantic scene he tried to take her hand but her fingers fled, so he thought she was not interested. When they went out, she said there were things he needed to know about her. She was no cyborg but she had had a heart transplant on the day she was born, otherwise she could not have been able to live. She knew how little John thought of -what he called- mechanical hearts and she wondered whether he would still like her after learning the truth. 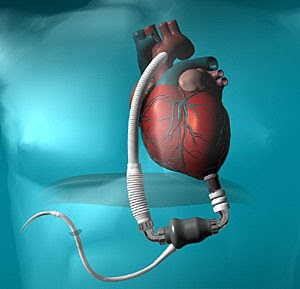 John felt bewildered as he never thought such a sweet human being could rely on an artificial heart. All things considered he came to the conclusion that no matter a heart was artificial or not, it was how it worked that counted. That said, he realised he had parted from love for too long now, his heart had become rusty and emotion-proof. He could feel the lady’s affection but was unable to respond to it. He was left alone with two great mechanical legs, a loud mechanical voice and a real heart that no longer worked properly. He was no more than an avatar desperately running after his heart's shadow. Nb: This is the first science fiction story I have ever written, tribute to Pallav’s 2090 Dreamer who inspired it.